The Health and Safety (Safety Signs and Signals) Regulations 1996 state that hazard signs should be used to make people aware of a nearby hazard or danger. For instance, hot water or a hot surface should have an appropriate warning sign. This is to reinforce the hazards of temperature exposure to employees and visitors, and to reduce the risk of burns and scalds. See our buying guide on temperature signs for more information. We have available a range of durable and affordable sign fixings that are suitable for use both indoors and out to ensure that your new signage is displayed in a prominent, secure position to keep people safe and informed. 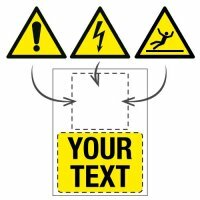 Our wide selection of temperature warning signs is designed to alert and inform people of the presence of hazards in the area around them. 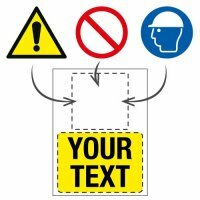 Sold in a variety of sizes, materials and orientations, displaying such signage in and around your premises ensures that you comply with current health and safety regulations – as well as helping to reduce the chance of any of your employees or visitors having a temperature-related accident. There are some tasks within the workplace that expose employees to high levels of heat. These extreme temperatures are dangerous and pose several potential threats to a person’s safety; they could even result in death. It is crucial, therefore, to protect all employees whose job involves them directly accessing hot items or dealing with high levels of humidity, radiant heat sources or other temperature-related situations. When it comes to heat-related injuries, the number one most common example of this type of accident is accidental burns, which are typically caused by direct contact with steam, high levels of heat or touching hot surfaces. Heat stress is another nasty, yet common, heat-related hazard experienced by many employees that can cause symptoms such as cramps, heat exhaustion, heat stroke (which can lead to death) and rashes. OSHA (the Occupational Safety and Health Administration committee) have put into place several guidelines to identify these hazards and safeguard staff. Business owners are urged to adhere to these guidelines. If staff could be exposed to high levels of heat they must be warned of the associated risks. This is where temperature warning signs and training material come into their own. As well as taking steps to warn those close to the hazardous area of the risks they’re exposing themselves to, employees and premises owners should also be prepared to treat potential injuries with the correct specialist equipment for the situation. Although general first aid kits are useful to help treat most kinds of minor injuries that happen in the workplace, when it comes to injuries sustained from extreme temperatures, it’s important to have the correct materials to hand. Should the worst happen, one of our fully compliant and comprehensive burns kits will help provide the injured party with the effective and immediate treatment required. These kits, which should be stored close to the areas containing temperature hazards, will be sufficient to treat burns or scalding and ease the pain for the sufferer. Dependent on the severity of the injury, a trip to hospital may also be necessary. Keeping those on site well informed of the hazards of exposure to high temperatures will prepare them for the risks ahead and help them cope with working in hot conditions. This will, ultimately, safeguard them from harm and allow them to perform their role safely and efficiently. Seton also provide a wide range of other warning signs and danger signs to keep employees safe in the workplace.